Hand-numbered limited edition of just 95 pieces! Each canvas print is signed by the artist and comes with a certificate of authenticity! Measures 28-inches tall x 21-inches wide. With blaster in hand, lovely but tough Princess Leia Organa of Alderaan lights up this impressive interpretive artwork inspired by A New Hope. 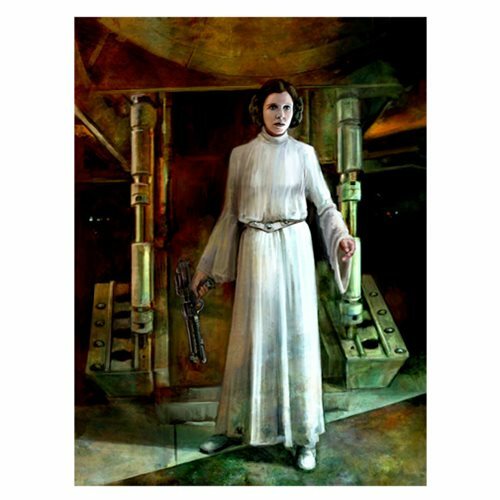 Measuring 28-inches tall x 21-inches wide, the Star Wars Somebody Has to Save Our Skins by Cliff Cramp Small Canvas Giclee Art Print is an unframed limited edition of just 95 hand-numbered pieces! Each canvas print of Sombody Has to Save Our Skins is signed by artist Cliff Cramp and comes with a certificate of authenticity.